Heat Press vs Screen Print: Which One’s Better!? Once you start looking into the subject you will see that it is incredibly simple to design cool t-shirts and other garments these days. Modern technology allows us to create wonderful designs with no fuss and at little cost. You can get a professional looking creation at home with little effort or expense. Yet, before you get started there are a few important points to look at. Chief among them is the type of machinery and process that you will use. There is more than one way to do this, so you will want to choose the option that makes most sense to you. This basically boils down to a question of heat press vs screen print techniques. These methods produce similar results but there are some crucial differences between them that you need to know about. Which one will be best for you to use? To work out the answer we need to start by taking a good look at what they both involve. We can then see in which situations each of these machines would be most suitable. 1 What is a Heat Press and What Does It Do? 2 What Is Screen Print? 3 Which Is Easier to Use? 4 Heat Press vs Screen Print: Which Is Cheaper? 4.1 Who Would Be Best Suited to a Heat Press? 4.2 Who Would Be Best Suited to Screen Printing? 5 Might You Need Both? 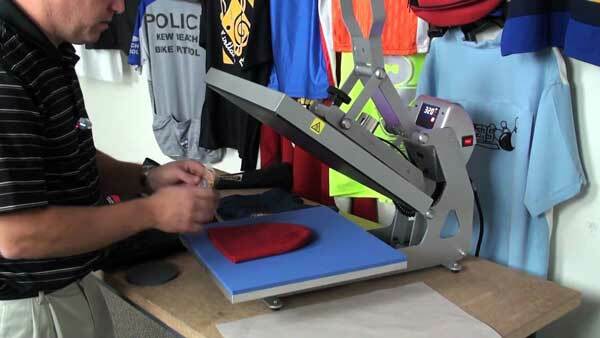 What is a Heat Press and What Does It Do? 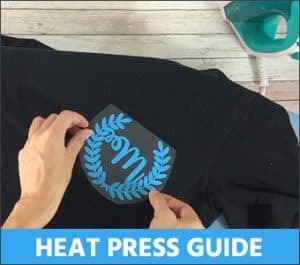 The heat press technique uses both heat and pressure to transfer a design on to a fabric. This method uses a heat press machine to do the work. A starter pack will typically come with a set of vinyl transfer, blades and everything else that you need. The latest models also take advantage of current technology for a user-friendly experience. This includes internal memory and LCD lighting to make using it a breeze. These are highly versatile devices that can work on a lot of materials other than clothing. For example, heat pressing can be used to add graphics to items such as plates, mugs, tablecloths and such-like. The work you can do will depend upon the specific model you choose, so it is worth thinking about this issue in advance. Each type of machine and transfer will involve applying heat and pressure for a fixed period of time. This process starts off with the design of the graphics on transfer paper. It is then transferred across to the material, where the heat and pressure ensures that it is firmly adhered to the fabric. Heat press transfers can be created digitally. It is worth pointing out that this is a clean process that harms the planet a lot less then screen printing, which uses more chemicals. Among the biggest advantages for anyone looking to get started is that it is an inexpensive process that it is easy to get the hang of. If you only want to print designs as a hobby or as part of a modestly sized business then this is a smart way of doing so without spending a fortune on your equipment. Complex and multi-coloured designs can be easily used in this process too. 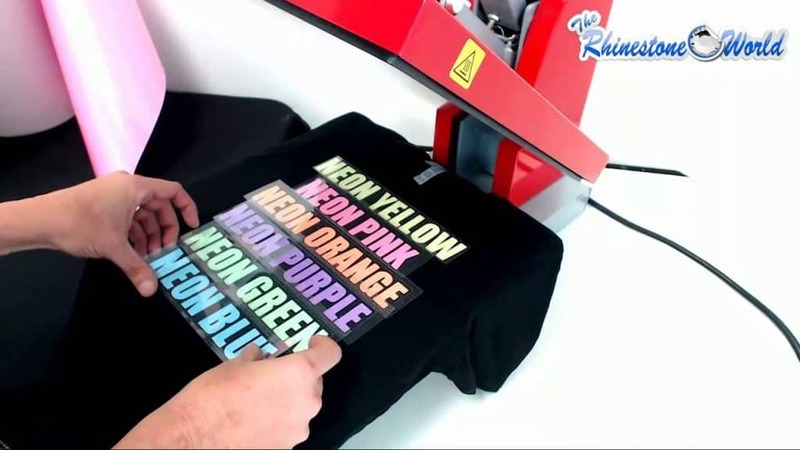 However, although the end result will look impressive, it may not last as long as garments that have been designed using the screen printing technique. You may also feel that it gives the t-shirt a slightly bulky feel where the design has been transferred on to it. Equally, for the mass production of t-shirts or other products this can work out as a more expensive approach in the long run. Yet, the overall benefits of doing this are big enough that it has become massively popular in recent time. These machines come in automatic, manual and now semi-automatic models as well. Digital models allow the user to get full control over the heat transfer process for the best results. A quick look at models for sale will show you that there are plenty of options to choose from depending upon your exact needs. This is a screen printing technique that uses a mesh to pass ink onto the fabric and a stencil to stop it colouring the parts of the garment to be left un-touched. The person carrying it out needs to use ink and the stencil as well as a variety of tools and chemicals during the process. Screen printing is typically carried out by big companies who are transferring designs to hundreds or thousands of garments. It is cost effective when used in this way but tends to be far less cost-effective when used on a smaller number of t-shirts. This process can give better results than heat pressing for some designs. The end result may be brighter and more durable over a longer period of time. However, with other designs you will find that screen printing isn’t a suitable approach. In particular, it isn’t great at handling complex designs or designs that contain a number of different colours. The time needed to carry out a job like this is sure to put a dampener on your plans if you were to try it. The fact that more equipment is needed is probably the biggest drawback for people wanting to use this technique at home or for a small business. It isn’t particularly expensive to get started with but it does need a fair bit of equipment and accessories. Screen printing has been carried out for centuries, with its history traced back to Ancient China. It became hugely popular in the West in the 20th century, as artists and designers realised that its versatility offered them a huge amount of potential. 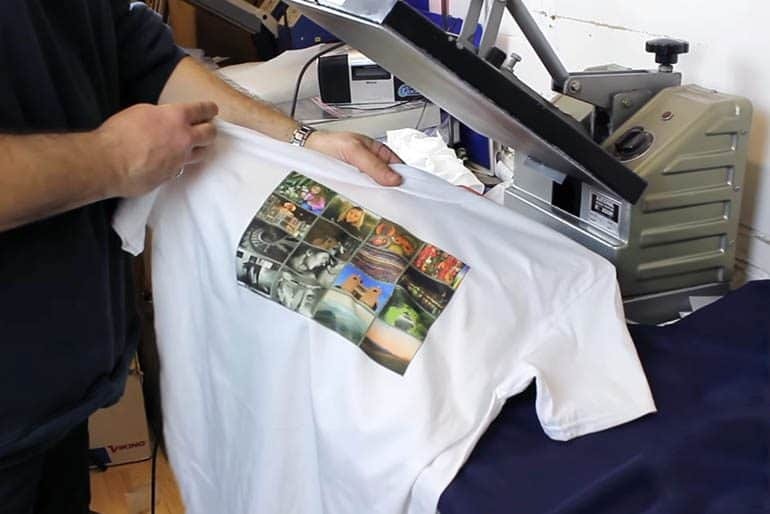 Having had a brief look at the basics of each of these processes, it is now time to look at the issue of heat press vs screen print in terms of the pros and cons of each. Let’s start with the advantage of screen printing. Naturally, there are also some disadvantages to screen printing that we need to take into account as well. Expensive to get started with. As we turn our attention back to the heat pressing method we can see that it also has a number of advantages and disadvantages. In many cases these are the exact opposites of the pros and cons that we saw with screen printing a moment ago. So, which method should you choose to use if you want an easy life? The truth of the matter is that a heat press is easier to learn to work with. In fact, this is no doubt one of the reasons why this method is more popular with people who are doing this as a hobby. If you want a device that you can just pick up and start using right away then a heat press is going to be your best bet. This is something that anyone can use without any sort of training or special skills. The screen print technique is a bit trickier, although that doesn’t mean that it is impossible to learn. If you have a little bit of time to get used to it then you will soon be happily screen printing without any problems. 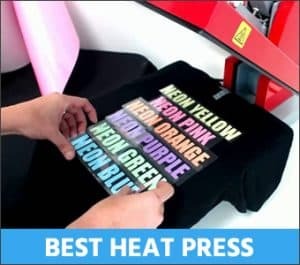 Heat Press vs Screen Print: Which Is Cheaper? The next important point to consider is around the cost of the equipment. After all, whether this is for use as a hobby or for a business you won’t want to spend more than you have to on it. The good news is that you can get a heat press at very little cost these days. You can find a good quality model online from comfortably under $200 if you look at the lower cost end of the market. Obviously, bigger and more professional machines that are more expensive are also available if you want to spend more on something that should last for longer. On the other hand, screen printing machines tend to start off a bit more expensive. There is also the fact that you will need to pay for more accessories as you use it over time. The difference in price isn’t really massive on most machines. However, if you want a top of the range screen printing kit then you will need to pay quite a lot more than you would for a heat press. Compact heat presses tend to all be around the same price at the time of writing. Who Would Be Best Suited to a Heat Press? Having looked at all of those details the key question now is; who would be best suited to using a heat press to add designs to clothing? Is there a strong reason for believing that you would be better with one technique than with the other? You want to design t-shirts and other good for you and your friends, purely as a hobby. You want a high degree of versatility in terms of the colours you use and the materials that you transfer designs onto. You want to get started cheaply and easily. You would like to avoid harming the environment when you do this work. Who Would Be Best Suited to Screen Printing? You are planning to add designs to large number of garments. You are more interested in a high quality finish than in being able to use complex designs or numerous colours. You are happy to pay a bit more for the equipment. Could it be that you need to use both types of machine? Well, if you are running a big printing business then having the option of using one or the other certainly wouldn’t be a bad thing. As we have seen in this heat press vs screen print summary so far, there are times when one is more useful than the other. If you want to always offer the best service then being able to choose between both type of machine would be an excellent position to be in. If you are only using it for personal use or for a small business then having two different machines might seem like overkill. However, if you get a lot of pleasure out of using them then there is certainly nothing to stop you from doing this. 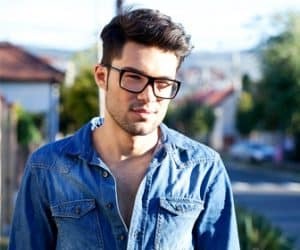 There is no doubt that that both of these techniques have made it very easy to design interesting t-shirts and other garments. Many people all over the world run successful businesses using either or both of them. It seems safe to say that heat pressing has a broader overall appeal. Its versatility and cost-effectiveness makes it perfect for many different situations. Screen printing is more limited in reach. This is because it is best suited to a fairly large t-shirt printing business that is going to use it frequently.